Burma Burma at Select City Walk - CHOMP! SLURRP! BURP! Burma Burma is that one of it’s kind place which despite being vegetarian, sees meat eaters like us time and again. 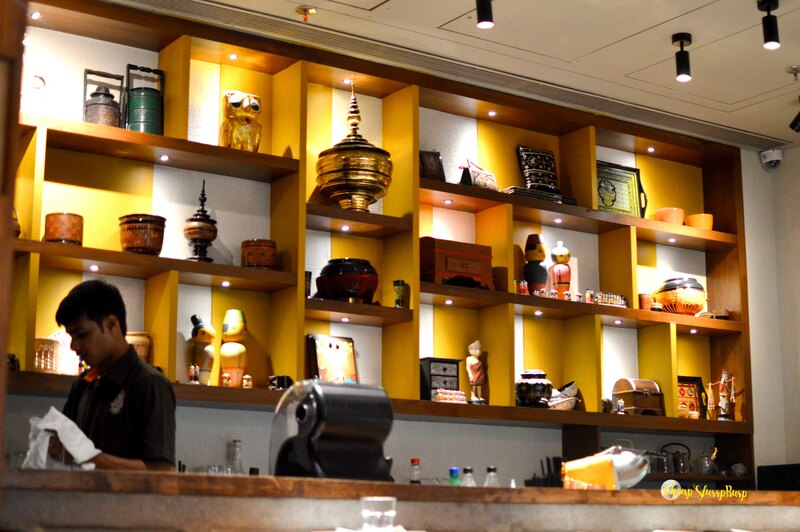 This Burmese diner and Tea Room has finally made it’s debut in Delhi, at Select City Walk, Saket. With inspiration from the various Asian tribes, they have created a menu with lots of fusion flavors and addition of more of their delicious Khow Suey. Sip on some of their finest tea and chomp on freshly churned ice cream. We started with Soups and Salads – the black pepper soup is the perfect relief for a sore throat – a thick vegetable broth with crunchy veggies and loaded with black pepper. So soothing. Rosalie Soup – the tea leaf broth is more pungent and with a slight sourness. Samosa Salad – the desi samosa, broken down with some lightly flavored greens, crisp chips and a light sweet dressing. I am not a very big samosa fan but this salad is what every lean eaters dreams are made of – flaky crispy samosa covering, lightly tossed potatoes and salad crispies. Sunflower leaves salad – whole sunflower leaves, tomatoes and crisps – I have always loved this salad here! Guava Salad – thinly sliced guavas, peanuts, crunchy onions and a sweet and tangy dressing – light and very refreshing. Lotus Stem fritters – thinly sliced lotus stem, tossed with paprika and a refreshing homely punch of curry leaves. Mock meat buns – when dining at Burma Burma, you seldom miss meats, but in case you do, they have some up with smelting buns. Steamed buns topped with black sesame seeds, crunchy fried soy that is as good as chicken and a flavorsome sauce – so delectable. Cream mashed corns and malabar parantha – chunky pieces of creamy corn served with out of this world flaky and buttery malabar parantha. Pan fried dumpings – the crunchy bottom topped with raw papaya shreds and a thick tomato sauce – a truly insane dumpling bite. The classic Burmese Khow Suey – this place is absolutely the BEST for Khow Suey. Burma Burma serves an array of different khow suey versions, but my favourite remains their classic one. A thick creamy broth, customized with loads of condiments and a silky coconut milk flavor. That is comfort food done right with a dash of lemon, loads of caramelized garlic and onions, and peanuts to balance off the crunch. Stir fried veggies with tea leaf fried rice – lots of greens, stir fried in a aromatic yellow curry and served with a perfect infusion of tea leaf paste and fried rice. Sticky rice, banana leaf – sticky rice tossed in a sweet and tangy tomato gravy and steamed in a banana leaf. Pungent, gooey and packing loads of flavors. Coconut custard – this looks like a truly deconstructed summer, thick and creamy, coconut custard paired with buttery crumbs and a sticky, irresistible toffee sauce. Avocado ice cream – the first time I tried their avocado flavor, it was not one of my favourites. But today, the smoothness of the flavors and slight sweetness was absolutely a delight. Bubble tea – they have some insanely good bubble tea range. Not a lot of people like the idea but I am a sucker of Pearl Tapioca and just the slurpy playfulness is lovely. Tried their refreshing lemon mint flavor and the black, activate charcoal finished with sprinkles. Always finish your meals at Burma Burma with one of their tea pots – we tried the White Tea. Watching the white tea brew, is an absolute delight; served with cheese sticks and toasted sunflower seeds. The tea is light, soothing and a perfect end to a lovely meal. Burma Burma serves some gorgeous salads, and I absolutely love their recent fusions with malabar parantha – be it the mashed creamy corn or the puffed rice and of course the khow suey. And always spare your appetite for their desserts and tea.